Now it is time to test a couple of the sketches to decide of the final pose. The best way to do this it to create a miniature 3D sketch in clay. As the clay is soft it needs to have an armature and an armature stand to support the clay. 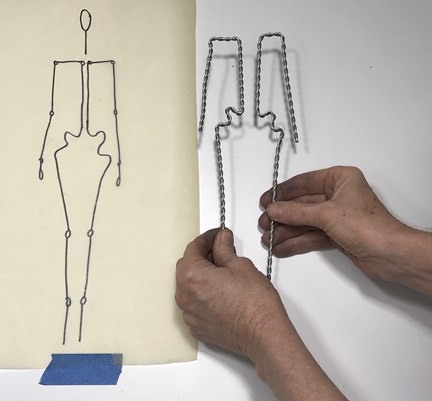 The sketches will be designed on 12” armatures and will not be finished works, but sketches that you can experiment with and view from all angles as part of the design process. You can buy pre-made armatures and supports or you can make your own. I have bought an armature back iron support and will attach it to my own board and then build an armature. 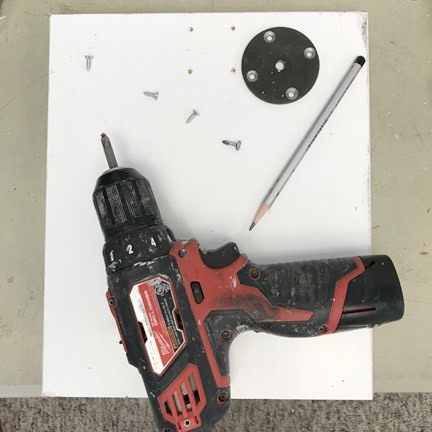 Cutting shelving board to size, I drill holes for the back iron support. The finished board with the back iron in place. Next I draw the figure at 12” high. The average person is about 7.5” ‘heads’ high. For art purposes this measurement is usually 8 heads high for a more pleasing look. 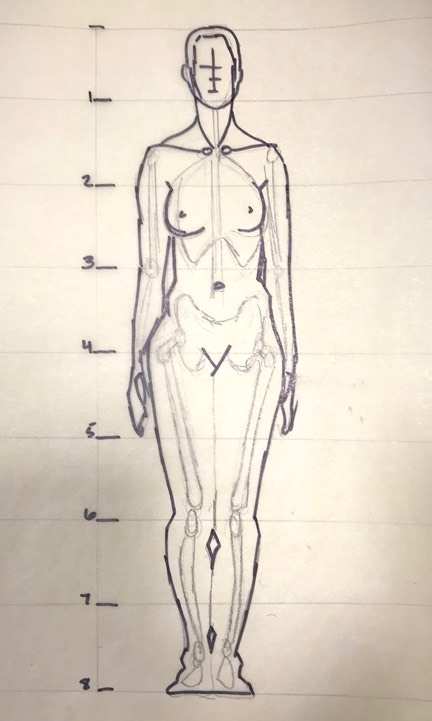 So for a figure at 8 heads high and 12” high overall I break the drawing down into 8 heads measuring 1.5” each. 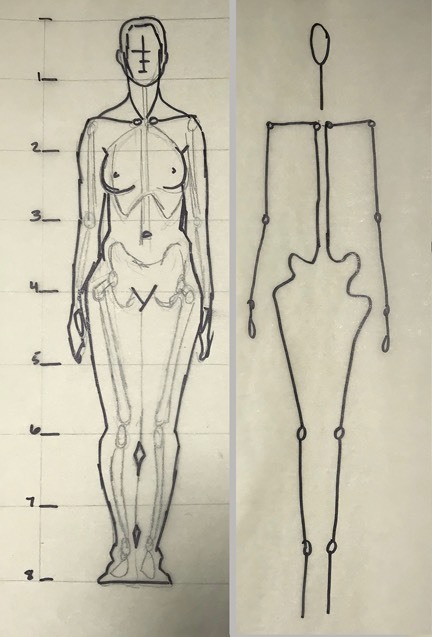 The drawing is a simple outline and I have sketched a simple skeleton in place to help with the armature design. 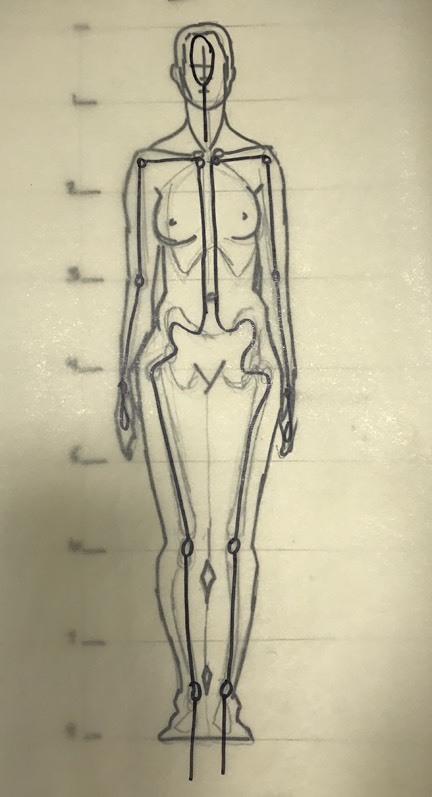 Using a piece of tracing paper and a sharpie pen I draw a simple two-piece armature design over the skeleton with circles showing the more important joints. The head armature will be separate from the left and right halves. As this is a small sketch and not a finished product, I will not be making hand or feet armatures. 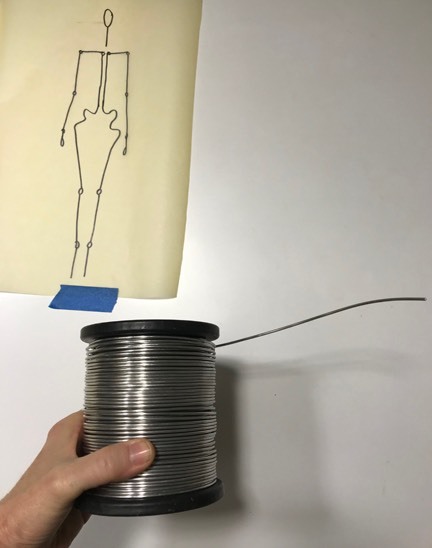 Armatures can be made from many things but the most common is aluminum armature wire. It is very soft and pliable and the clay will have a tendency to slide around or come off of the smooth wire. For that reason we often wrap larger wire with a thin wire to give the clay something to hold onto. For thinner wire, it is best to twist the wire to make it both stronger and to give the clay some tooth to grab onto. 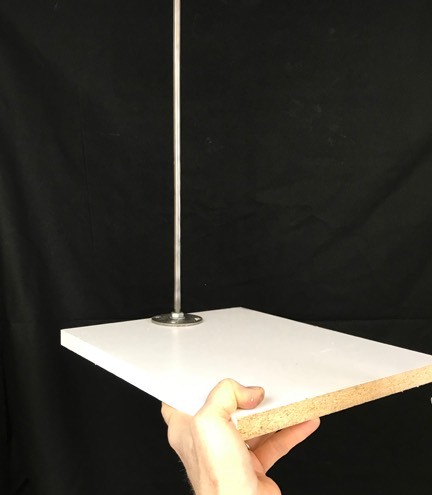 After you have twisted two sets of wires, it is time to use your armature drawing, sometimes referred to an an armature map to make the two sides of the armature. You now have the left and the right sides of the armature complete and it is time to lash them together. I have found that tiny zip ties work really well to anchor the two sides together followed up with a wire wrap. I am leaving the center of the two sides unwrapped to allow a place to attach the armature figure to the back iron support. Zip ties are also known as Cable Ties and can be found in the electrical sections of hardware stores. The ones I am using are 4” cable ties. The zip ties hold the two armature sides together well but for added strength and clay grip I wrap both the top and bottom zip ties with thin wire - leaving the center unwrapped to attach to the back iron. The armature is now ready to be attached to the back iron on the armature stand and begin sculpting work.